That Business Show grows more and more each day and today was no different. The show and myself will be featured in an upcoming article in The Business Observer as I was interviewed by the Paper after today’s show. Look for it in the Business Observer which comes out on Fridays in the next 1-2 weeks and be sure to listen live weekdays at 8am on 1250 WHNZ or anywhere in the country on the iHeart Media app or at http://www.tampabayradio.com! Today was Working Women Wednesdays brought to us by the influential Tampa Bay based networking group, Working Women of Tampa Bay. 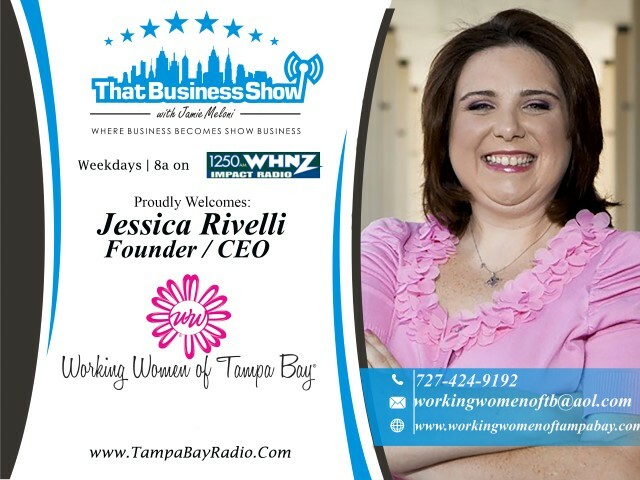 Jessica Rivelli, CEO and Founder, opened up the show with a promotion for the upcoming Fashion Show Birthday Brunch being held May 29th at Ruth Eckerd Hall from 9 to 11 am. This is in celebration of the group’s 6 year anniversary. Space is still available and for more information, visit http://www.workingwomenoftampabay.com and click on events. There you will see the event and many more to get involved with! Carole Sanek was the next guest on the program. Carole is the CEO of Social Butterfly Media Marketing LLC and the creator of the podcast The Crazy Marketing Ladies Show. She has a background in Real Estate which led her to blogging and from blogging to the use of social media as a tool to promote her blogs. She is an award winning blogger having written blogs on breast cancer awareness/prevention and now focuses on social media through her Butterfly Blog located at http://www.carolesanek.com. We discussed her business and she shares with us tips on proper social media use for businesses. She stressed the importance of blogging and email marketing for business owners because they are pieces of “real estate” that they own essentially. Social media platforms while effective can be taken away from a user if the platform deems inappropriate content or usage of the site and you, the business owner, could lose years of work and many followers. Blogging and email campaigns are your own property and an effective tool for business owners to grow and promote their businesses. Carole is also a podcaster and her podcast, The Crazy Marketing Lady, can be found on iTunes as well. Carole can be reached at 352-540-0177 or email at carole@carolesanek.com for more information and be sure to visit her website http://www.carolesanek.com for more tips on social media and to follow her blog! On the 2nd half of the show, Lisa Emmons, Image Consultant and Founder of Posh Image Consulting was in studio. Lisa’s training and certifications come from the Fashion Stylist Institute in San Francisco and she is certified as an Image Consultant, Color Consultant, Wardrobe Stylist and Elite Personal Shopper. She also serves as the Vice President of Marketing & Communications for AICI (Association of Image Consultants International) and just recently became an Ambassador for Working Women of Tampa Bay. Lisa and I talk about ways to present yourself in an interview or in the dating scene and we share some good laughs as this is an area I am lacking in, with regard to image and style. Posh Image Consulting services help with job opportunities, promotions, presentations, gain more clients, dating, improve social status, gain self-confidence, feel empowered, and feel magnificent. Lisa is actively engaged with the Fashion Show Birthday Brunch on May 29th as part of the Working Women of Tampa Bay’s Birthday celebration and is available to assist you, both men and women, in enhancing your image. Learn more at http://www.poshimageconsulting.com and reach out to Lisa directly at 813-579-8840 or email at lisa@poshimageconsulting.com!